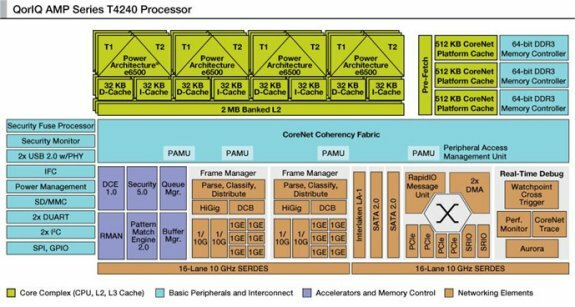 Bright Side of News reports Freescale has added two new 28nm processor series to its QorlQ T-series AMP processors; the 12-core, 24-threaded T4240, and the 8-core, 16-threaded T4160. These chips targeted telecoms. The company announced two models from its QorIQ T-Series AMP processors manufactured in 28nm process, operating at frequencies up to 1.8GHz. T4240 is a 12-core, 24-thread processor, while T4160 is an 8-core, 16-thread processor (essentially a value version). Both are based on the new 64-bit Power e6500 dual-threaded core which was launched at the last years Freescale Technology Forum in San Antonio, TX. E6500 PowerPC core is not the only innovation - T4240 and T4160 support The processor comes with 768KB of L1, 6MB of L2 and 6MB of Platform Cache. This is combined with support for contemporary memory standard (192-bit, triple-channel DDR3), Interlaken-LA interface as well as PCI Express 3.0 support. Furthermore, the CPU integrates USB 2.0 and dual 10 Gigabit Ethernet.